good morning and welcome to day three of our cabin re-design! today grace is here, and she is remaking a tiny kitchen into a breezy, beautiful, welcoming jewel-box of a space. i try to maintain some degree of professionalism on this blog, so i've edited out all the capital letters, exclamation points, and freak-out noises that this kitchen incited in me when i first started writing about it. but seriously, i love it sooo much and can't wait for you to see it. 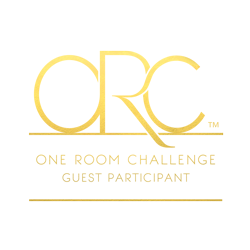 but first, let me introduce my guest. 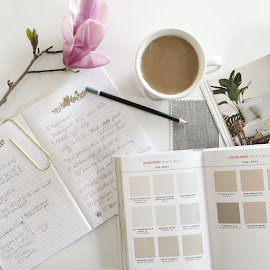 grace is the brilliant mind behind the big reveal blog, a decor and DIY space (mainly) where she talks about the things she's got going on at home and in life. (my facebook friends will recognize her as the author of the over-the-top-hilarious disney world post that i was gushing about recently). grace comes at blogging with a genuine and honest openness and a hysterical wit that makes you feel like her friend after reading only one post. not only is she one of the best writers i know, but she has some serious design skillz as well. ready to see her kitchen?? When I saw the kitchen in Laura’s imaginary cabin, my brain exploded with ideas and I enthusiastically jumped in with both feet. While it would be amazing to open up the space to the living areas, I decided to simply update the space I had. I would replace the upper cabinets with white upper cabinets on one side and open shelving on the other. 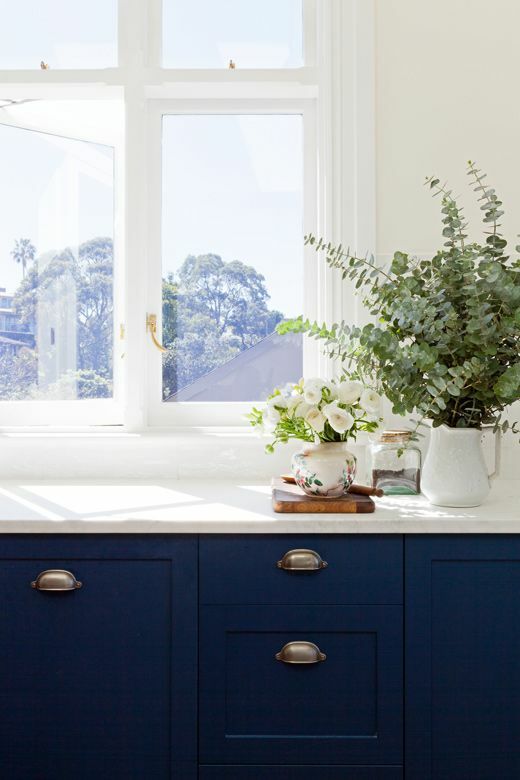 The bottom cabinets would be painted a rich, but lively blue. I fell in love with the aptly named Bosporus blue from the West Elm paint collection for Sherwin Williams. I am an absolute sucker for an all white kitchen, but the pop of blue makes the kitchen feel alive. I finished off the cabinets with stunning modern gold drawer pulls. Keeping the same layout, I would add a white farmhouse sink, a small Wolf gas range, and new fridge. I die for these Cambria Torquay countertops. In fact, I kind of have my heart set on them for my own home if the budget fairy ever lays a giant cash egg on my doorstep (do fairies lay eggs?) The countertops have the look of a Carrera marble, but are super family and budget friendly. Above the sink, the round, milky glass pendant from West Elm gives a nod to the classic feel, but still feels a bit mid century modern. In front of the window, I would add this beautiful white tulip based table and two clear LexMod Slither dining chairs. I didn’t want to overwhelm the space with seating, since the cabin features a well-decorated adjacent dining room, but did want to have just enough eat-in space to grab a quick bite or to chat while the chef du jour makes my bacon (What? I can’t have a chef?) Above the table hangs this cagey gold diamond pendant that keeps the space from feeling too traditional. When I think about how the space will be used, I imagined sneaking down in the first morning light and sipping a cup of coffee by the window before the rest of the house wakes, making big breakfasts for the gaggle of kids that would spill into Kyla’s gorgeous dining room, and later having a glass of wine with the girls while we cook dinner. I wanted the space to have a balance of serenity and the straight up joy of family. Because the space is so classic, the accessories really make it sing. I essentially went on an Anthropologie binge, because I always heart their kitchen collections. There was no question that the Stripes Abound apron would end up in the mix. Ever since I incorporated it into a silent auction basket for my daughter’s school, I have been obsessed with having one. Is it practical? Probably not. Do I heart it? Absolutely yes. I also liked the idea of balancing all the white with some wood elements. From the bamboo knife block to the wooden spoons perched in a white canister, wood just grounds the space. A little terrarium for the table could be filled with succulents (obviously, this would not be a blogger kitchen without them), but also bits of wood or rocks found by the kids. I love the painted sea fan included in this one. While this cabin isn’t next to the sea, I like the subtle nod to the water. To infuse the kitchen with a little more color, I like these cute salt and pepper vessels to leave out on the counter, along with the modern geometric dishtowels, abstract napkins and straight-outta-your-grandma’s kitchen washcloths. The little bits of yellow feel sunshiney and fresh. My sister has a similar model in her home and nothing is better than being able to have on-demand coffee. If Laura’s lake house is anything like my grandparents’, people filter in throughout the morning and afternoon on their own schedule and could easily customize their coffee from straight up to venti mochafrappalattelicious at the touch of a button. Bonus points for having no coffee pot to clean up at the end of a long sun-filled lake day! I am a big fan of Michelle Armas and used her large print to start this fun and diverse collection. 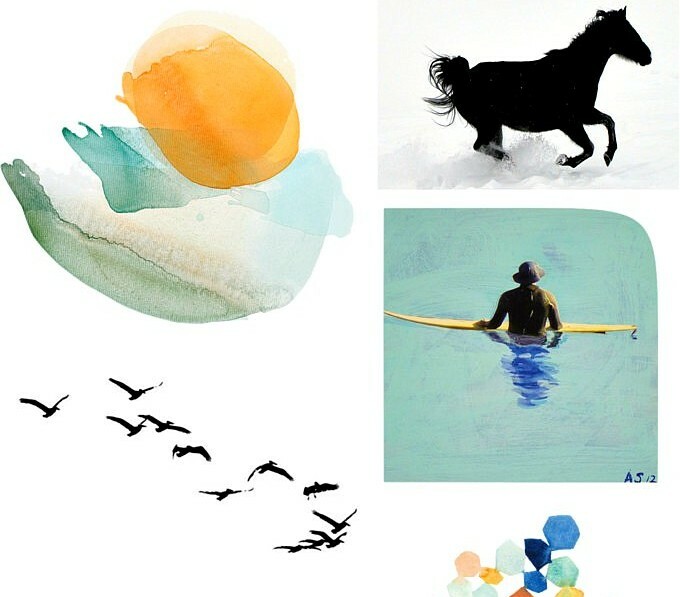 I pulled the other prints from Minted, which has such unique, but affordable designs. I love the hat wearing surfer, the geometric hexagons, and the abstract yellow Meadowlark. The colors look so beautiful together and the prints are perfectly complementary without being too matchy matchy or competing. To provide a bit of balance for the wall, so it isn’t too airy, I added two black-based prints. The kitchen in many homes is the center, the hub that draws the family together and I imagine this kitchen will, too. While it is a small space, it is rich and luxurious, yet simple and approachable which is the perfect combination for those fun family weekends at this cabin retreat. i was so excited to get to the kitchen, and though i love it ALL, my favorite part has to be that gallery of artwork. i would happily throw every one of those in my house today and call it good. i love how they evoke the water-side spirit of the cabin without being too literal, and are modern without being at all stark or harsh. bravo, grace! and thank you so very much. i just absolutely love everything about this. grace will be back on friday to close things out with a dreamy bedroom, and in the meantime you can visit her at the big reveal. you'll love getting to know her as much as i have. tell her i sent you and hi! stay tuned for tomorrow when my friend summer will be putting her touch on the cabin's bathroom. it's going from very sad to completely fabulous. 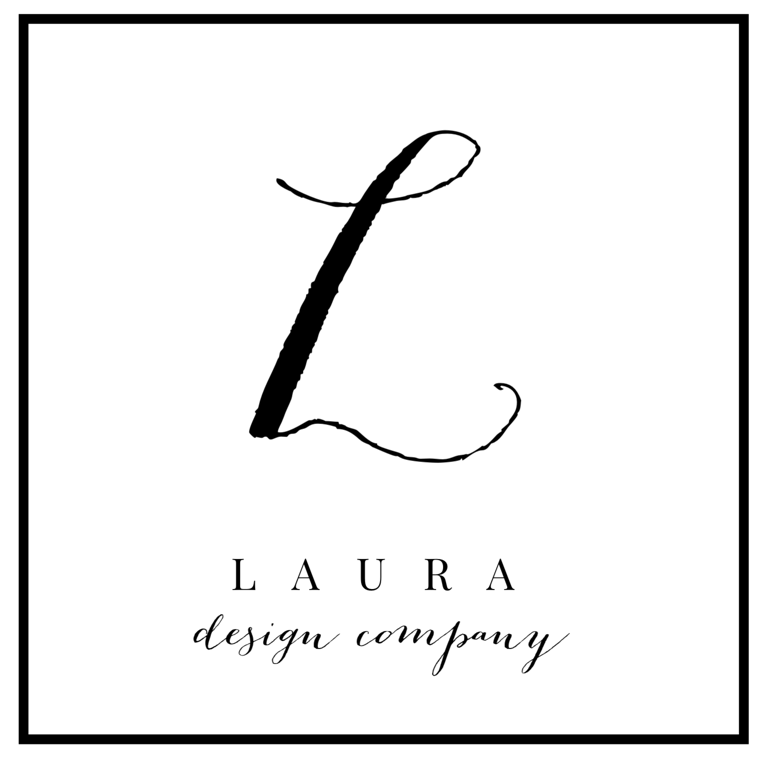 Laura, thank you so much for letting me be part of this series! It has been so. much. fun! And, that house is shaping up to be fab. When can I move in? Grace, did you know my aunt and uncle live on Smith Mountain Lake??? Seriously! That place is in timbuktu! Such a weird little coincidence! It's absolutely beautiful there! Ooooh! Love! I spy one of my artwork pieces!